The Board, functionaries within the Stockholm Culture Foundation, also known as the Stockholm Culture Awards, and the public submit proposals for candidates for cultural awards. The proposals are considered by everyone in the Medal Council. The proposals are submitted to the Advisory Board for approval. When this selection process is completed, the remaining proposals are given to the Board of Directors and they make the final decision on awarding the merit medals and diplomas. The merit medal is embossed in gold-plated silver and is in size equivalent to eighth grade. 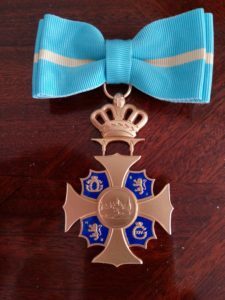 The merit medal is worn in a sash, which is light blue with a vertical yellow border that is two mm wide in the middle. The merit medal is also available in miniature. 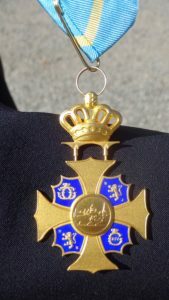 The image above shows the merit medal. A diploma is included with the merit medal. The merit medal embossed in only silver is given for merits from work performed for the Stockholm Culture Foundation and the Stockholm Culture Awards, such as work on the Board of Directors, Advisory Board, Medal Council or with fundraising.